Artist Seth Gadsden and filmmaker Sam Fleischner will open their collaborative exhibit, “Ricky’s Dragon,” June 17 in Loyola University New Orleans’ Collins C. Diboll Gallery, located on the fourth floor of the J. Edgar and Louise S. Monroe Library. The exhibition features more than 200 drawings on paper by Gadsden, many of which were created for Fleischner’s film “Stand Clear of the Closing Doors.” The images combine the colorful, playful and obsessive characteristics found in Gadsden’s own work with the imagined personality of the film’s main character, Ricky, a 13-year-old autistic boy from Rockaway Beach, New York prior to Hurricane Sandy. 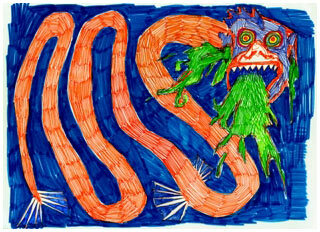 The images depict Ricky’s obsession: the mythological sea creatures and the swirling, tumultuous waters they inhabit. The exhibit also features two of Fleischner’s videos of the waters of Rockaway Beach before and after the hurricane, with Ricky’s narratives in the background. The main symbol Ricky draws throughout the film is the ouroboros dragon, an ancient symbol representing the infinite cycle of destruction and creation. Three weeks into movie production, Hurricane Sandy, an unprecedented storm for the region, manifested that idea and destroyed the northeast coastline and Rockaway Beach. The film premiered at the 2013 Tribeca Film Festival, where it received a special jury prize for best narrative feature.